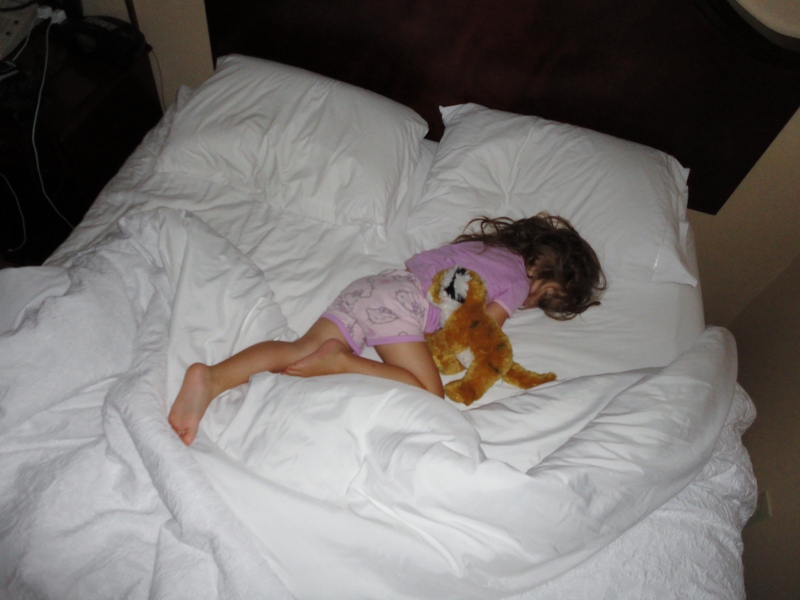 Thursday night at the hotel, my 2-year-old slept in bed with me. She kept her fingers twisted in my hair like some strange leash all night. Every time I started to scoot away, she pulled me back, tightening her grip on my scalp. When I finally broke free, she decided to start kicking me in the face. Needless to say, it was not a very restful night. By 6:30 a.m., I was able to pull myself from sleep to start getting ready for our first day on the road. By 8:30, we rallied the troops, ate breakfast and hit the highway. Ten minutes later w e heard the dreaded phrase, “I have to go potty. NOW!” So we made our first pit stop at a Lowe’s just minutes from the hotel. I had to drag my toddler past aisle after aisle of enticing, sparkly products before reaching the restroom. Turns out she didn’t even have to go. Just wanted to look around a store and get out of the car. Not a good way to start the day. The next 30 minutes was spent watching the kids pull out every activity I packed for them and scrutinizing each one. Occasionally they would take a moment to try one and then move on to the next. Once they finished surveying the goods, the kids seemed content to watch a movie and color. My 4-year-old and husband pulled out a bat and ball at a rest stop to burn off energy and stretch a bit before returning to the cramped quarters of our car. By 4:30 pm., we completed our nearly seven hours of driving and settled in at another hotel. The kids were thrilled to see their first road trip gifts – a reward for their good behavior all day. They each received a new toy cell phone that they promptly lined up on the night stand and pretended to set their alarms. Daily lesson learned: No amount of planning and preparations can help you predict a child’s bodily functions. Some things are simply outside your control. Emily Shedek is the co-creator of The Moving Mom. For more information on Emily and her family’s move from New Jersey to Missouri, follow this blog on Twitter @TheMovingMom or on Facebook.